The fact that a central European country is as appealing to tourists as Niger, Chad, or Sudan has already caused much discussion in Belarus. Two facts add fuel to these discussions. First of all, Belarus attracted an unexpectedly low amount of tourists during the 2014 World Hokey Championship. Only 137,400 organised tourists visited Belarus in 2014 (0,5% growth compared to 2013). 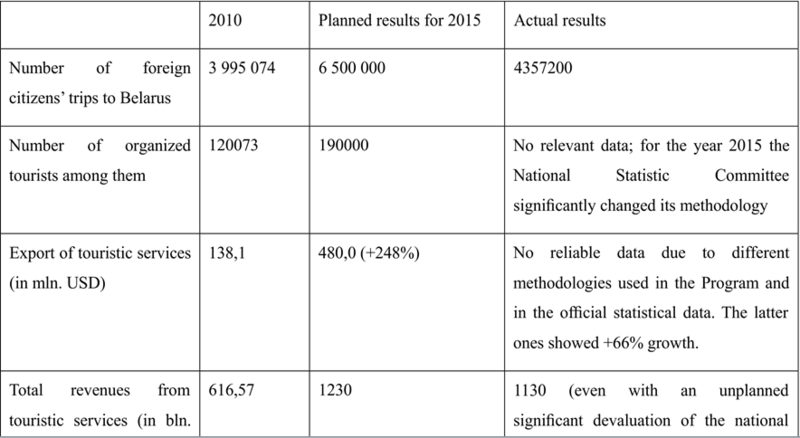 Unfortunately, due to a change in methodology for the year 2015, the National Statistics Committee has not published reliable data. Secondly, in 2015 Belarus completed the state tourism development programme for 2011-2015. BYR 4299 bn were allocated for only a portion of the Tourism development programme's implementation. Given the large amount of money invested, one could expect either better results or a deep analysis of the failure. Unfortunately, before its implementation the programme performed only a fragmented analysis of the tourism sphere. Moreover, the authorities have provided no reports on the programme’s success. The officially quoted number of organised tourists serves as a perfect example of statistical ‘games’ in Belarus. In 2010-2014 the authorities provided this figure without counting separate excursions within the country as additional tourists. However, when the time came to file a report, the authorities had included excursions in this number: in other words, a tourist arriving in Minsk who was later re-registered in Brest or Hrodna because of an excursion could be counted up to three times. Thus, they claimed 276,260 foreign tourists but counted many of them at least twice. Unfortunately for the Belarusian authorities, the number of trips made by foreign citizens to Belarus reveals the actual situation. In 2010 this number amounted to 5,673,800 trips, while in 2015 it fell to 4,357,200 trips (by 23,2%). The number of tourists ‘served by organisations which provide services for tourists’ in 2010-2014 strangely corresponds to the number of organised tourists. However, in 2015 the statistical authorities named only 101,686 tourists. One can consider this figure as more or less accurate and far less than the planned 190,000 tourists. Unfortunately for experts, the programme primarily contains descriptive goals and indicators. Vague expressions such as ‘to examine the possibility, to raise the level’ or ‘to conduct discussions on the issue’ dominate in the programmes’ activities and / or expected results. Much time is devoted to studying the "international experience." The existing figures seem rather dubious and poorly grounded. The predominance of round numbers, the absence of correlations, as well as the overly linear rate of growth regardless of time period support these doubts. The programme provides neither explanation nor calculations for these figures. The correlation between figures also raises questions. One can hardly expect that growth in foreign tourists’ visits by 163% would increase the export of touristic services by 348%. However, neither the programme, nor the scarce information on its accomplishment, nor real results suggest any explanations for these figures. Moreover, the programme, designed as a five-year plan, fails to stipulate any serious inner mechanism of policy correlation which would take into account the unstable economic situation in Belarus. Most of its planned results (such as ‘development of the tourism market’) are practically unverifiable and leave a lot of room for embezzlement. The programme almost completely excluded any participation from interested public parties. State agencies acted as the programme’s ordering parties, designers, performers and even consumers. While many experts point to the complicatedvisa regime, the inexplicable system of registration of foreign visitors with the immigration police and the general unfriendly environment, the programme’s designers failed to co-operate with the Ministry of Foreign Affairs, the Ministry of Internal Affairs and the State Border Guard Committee. Private companies certainly have had no say in the programme. Poor service remains one of the main sources of complaints in the tourism sphere in Belarus. However, the programme almost completely failed to consider this aspect at all and provides no recommendations for improvement. The system of monitoring and control also remains strikingly undeveloped. The programme really stipulates only one form of monitoring and control – annual reports to the Ministry of Sports and Tourism and a following report to the Council of Ministers. Naturally, such self-reporting results in poor implementation and provokes numerous rumours about the corrupt nature of state programmes. The programme excludes any clear and reasonable criteria for its execution or effectiveness. Given the economic and political situation in Belarus, any medium-term planning appears impossible. The prevailing ‘manual’ methods of administration preclude setting strategic goals, developing long-term policies, or achieving predicted and grounded results. The apparent lack of public inclusiveness, transparency, and control suggest the programme’s real function is to act as an instrument of redistributing public funds among elite groups rather than developing the country's tourism industry. The statistical data confirm the simple truth: the development of tourism in Belarus requires comprehensive and fundamental changes, as well as mutual cooperation between business and the state. Otherwise, Belarus risks staying at the level of Niger, Sudan, Chad, Guinea etc. not only when it comes to appeal to tourists but in other spheres as well.